Halloween is rapidly approaching and with it, an excuse to eat a disgusting amount of candy. Normally, you'd be required to feel some modicum of guilt in order to belly up to a giant bucket of candy, but not in October! October is wonderful. It's candy time. And while there are the Halloween classics (don't say candy corn), maybe you need to spice things up this year and have a little method to your sugar-induced madness. Enter a map created by the travel site Family Break Finder. (Click here for a more detailed view.) 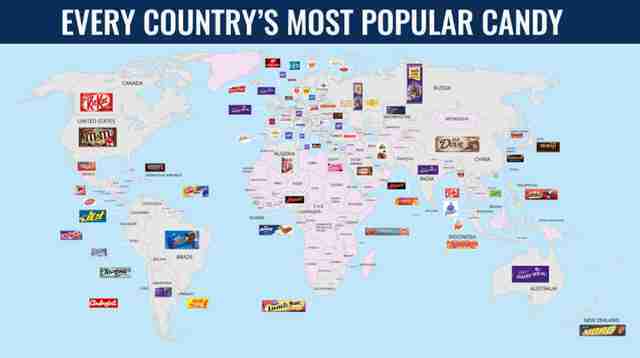 It attempts to lay out the most popular candy in many of the world's nations (some of which appear on the Thrillist list of the best non-American candies). The map doesn't have every country, and the methodology isn't perfect, but if you're using it as an excuse to eat candy, you have nothing to complain about. Of all the options available, Americans are reported to like a good ol' handful of M&Ms. That's a candy that only appeared once on a list of every U.S. state's favorite candy. Up in Canada, the preferred treat is a Kit Kat (did they see the Chance the [W]Rapper jingle?) and in Mexico, it's Trident gum. Though, is gum candy or does it have its own separate category? The map is compiled from a wide variety of data. "Sources used include global market research company Euromonitor and corporate websites," Family Break Finder says. 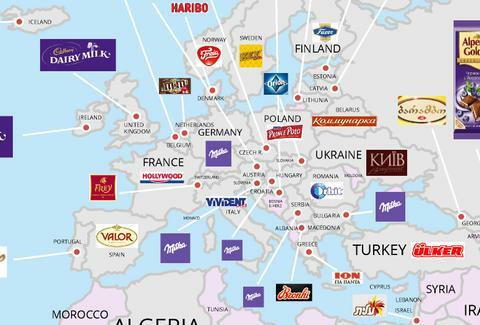 "Sometimes only the name of the overarching candy brand, such as Cadbury or Milka, was provided and not a specific product name." They also used the best data they could find in instances where there wasn't actual research to go off. For instance, there's no data on candy sales in North Korea. "In the case of North Korea, Choco Pie is an illicit marshmallow biscuit smuggled from South Korea," they write. "Despite being banned in 2014, it is thought to be widely available and – due to its superior quality to rival local products – the most popular confectionery product." Go forth, and give yourself an excuse to eat an amount of sugar that will make your doctor shake her head.